Just a two-hour flight from the continental United States, Belize is an easy-to-reach beach destination. It doesn’t hurt that the country has a good infrastructure and that English is an official language. Throw in some world class diving opportunities, the wonders of Mayan ruins and a plethora of excellent resorts, and the only question is why Belize wasn’t more popular sooner. 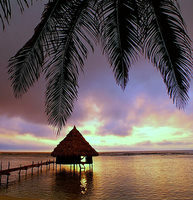 For the best deals on flights and accommodations, check out the BootsnAll Belize Travel Guide.